The problem is, not all mice are created equal. There are several types of mice, which means your method for extinction may have to change depending on what species is in your home. Not to fret fellow Toms, we’ll help you get rid of that pesky Jerry in your life. 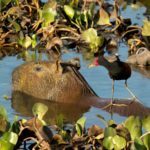 Let’s take a journey down the mouse hole as we fill you in on the most common mouse species you need to know about, and how you can get rid of them! There are hundreds of different species of rodents and mice. However, we are only going to be focusing on the 4 most common species you might come across within your home. The most well-known mouse species do more than fetch blocks of cheese at the end of a maze. They breed like crazy, sometimes producing as much as 14 litters a year, with up to 5 or 6 mice per litter. That’s a whopping 84 mice per year! That is a lot of mice to deal with, if not taken care of properly. On top of that, house mice can carry a plethora of diseases including Lymphocytic Choriomeningitis or LCM. This is a viral infection that can be found in an estimated 5% of all house mice. Just to put that in perspective, remember that 84 mice a year we mentioned? That means at least 4 of those carry this disease. Yikes! The house mouse is usually a dusty gray color with a small head, slender body, and moderately large ears. Their size can range anywhere from 2.5-4 inches in length. This particular species is the definition of a scavenger. They often will feed on fruit, grains, and seeds, which can be particularly aggravating for farmers when they start making their home in grain silos and storage bins. However, the food isn’t your worst problem when it comes to this species. Deer mice are one of the most dangerous species there is. They are the primary host for Hantavirus, along with other deadly diseases such as Plague and Lyme Disease. This is one species you do not want infesting a domestic property as they pose serious health risks to both humans, as well as pets. They do not breed nearly as frequently as house mice, producing on average 2-4 litters a year, containing around 4 mice per litter. But considering the higher health risks these mice pose, having them removed is of the utmost importance. Reddish brown in color, they have a white chest and feet, with a bi-colored tail and are slightly larger than the house mouse at about 4 inches in length. The wood mouse, also known as a field mouse, primarily make their homes in forests and fields. However, during the sometimes unforgiving winter months, they will make their way indoors to escape the cold. They feed on seeds, fruit and even insects. This species of mice is more of a nuisance than anything. 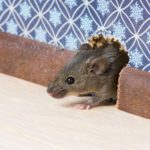 While not nearly as dangerous as the deer mouse, it is still not something you want roaming freely in your house. The female wood mouse can produce upwards of 4 litters a year, with anywhere from 4-7 mice per litter. This may not seem like a lot, but these offspring can begin breeding again in as little as 2 months causing for somewhat rapid reproduction if not removed quickly. They are usually a light brown in color, with darker fur around the spine. These mice have a more distinct nose and their bodies are more robust than the previous 2 mice I’ve talked about and are only about 3 inches in length. We just had to save the best for last! The notorious roof rat will do anything and everything it can to survive. They will make their home anywhere they can find food or shelter. Roof rats are known for causing fires and power outages by chewing on electrical wires and cables. They are also the largest rodent I’ve discussed so far, growing to anywhere from 6-8 inches in length with a tail that can be 7-10 inches in length. Roof rats usually have a black or brownish-grey color that can sometimes be hard to distinguish and have relatively small ears. These are ugly little devils! They can produce anywhere from 4-12 litters a year, with a wide range of 2-22 rats per litter, with an average of around 8. They also happen to be incredible climbers. So when you are searching for them, make sure to check even the highest of places such as your attic or within your ceiling. If you want to talk about a truly dangerous rodent, this is the one. 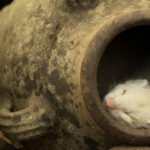 Rats have been known to spread 40 different diseases among humans including, but certainly not limited to, the bubonic plague, schistosomiasis, and tularemia. This is a species you want to eliminate as soon as physically possible! The first step in knowing how to get rid of these rodents is knowing how to identify what types of mice you are dealing with. Once you know the species, you can work on putting together a gameplan to eliminate them. Being proactive in the management of your pest problem can save you many headaches down the road. When you’re looking for the best way to be proactive, instead of reactive, you want to use a company full of experts that will work quickly and thoroughly to eliminate the problem at its core. The proverbial cheese is now in your maze. Are you going to sit back and let Jerry run circles around you, making you look foolish in the process? Or are you going to grab the mouse by the tail and eliminate these pests before they even know what hit them? You already know the answer to that question. It’s commonly said that life is a game of cat and mouse. Well today, it’s time to send that mouse packing! Schedule an appointment today to receive your free inspection and 5% off of your first service! It doesn’t get much better than that!